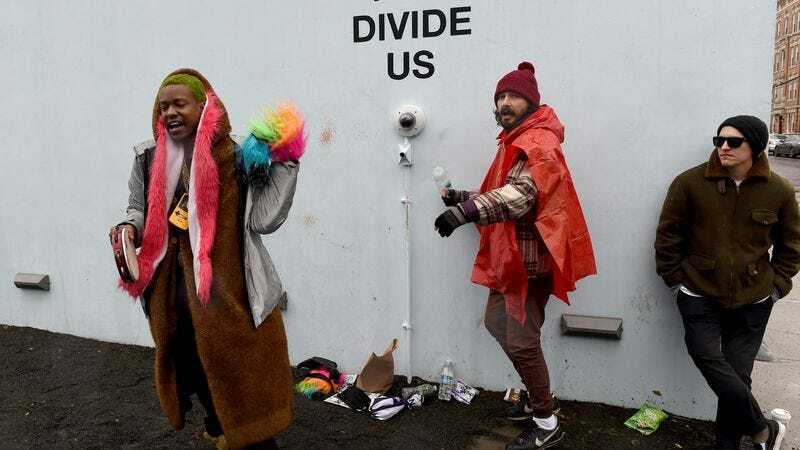 Shia LaBeouf’s “He Will Not Divide Us”—the 24/7 live-stream, created with his usual collaborators Nastja Säde Rönkkö and Luke Turner, that invited anyone to come and repeat that mantra as a demonstration of peaceful resistance against the fractiousness that so colors our nation—has been shut down because of too many fights, The Verge reports, approximately 3 years, 11 months, and one week short of its goal of running throughout Donald Trump’s first four years in office. The Museum of the Moving Image in Astoria, Queens issued a press release saying that, while the installation may have succeeded in being “engaging and thought-provoking,” it also resulted in “dozens of threats of violence and numerous arrests,” and it created “a serious and ongoing safety hazard” for everyone in the immediate area. And so, after weighing the benefits of encouraging a sociopolitical dialogue versus the risk of getting hit in the face, ultimately, museum officials decided in favor of encouraging everyone to take their important discourse about the need for peace the hell off their property. As we’ve reported since it began, lo, these three, edifying weeks ago, LaBeouf’s art project has become a popular spot for alt-right trolls, irresistibly drawn, like thinly mustachioed moths, to the light of yet another webcam to shout their Nazi slogans and Pepe memes into. Some of these confrontations even resulted in actual scuffles with LaBeouf himself, who found himself arrested after tussling with one of these proud, strong alpha males who said LaBeouf had pulled on his scarf and scratched his face. Fortunately, the big man was able to recover from his scarf-burn and resume calling people “snowflakes” on the internet, but the mark it left on the project was slightly more permanent. Such incidents resulted in a round-the-clock police presence, the Museum said, one that—while it at least guaranteed LaBeouf’s performance art an audience—also created an atmosphere of tension that was slightly less than conducive to the project’s thesis that everything’s going to be fine, so long as our actors and grad students remain here on the front lines, reading their poetry and forming drum circles. In the wake of the announcement, the He Will Not Divide Us website has since been changed to a static image of the words “THE MUSEUM HAS ABANDONED US,” followed by a statement declaring that while the museum might have walked away from the project, “The artists, however, have not.” It’s unclear, as yet, what that means, but it should reassure those who continue to feel helpless in the face of the Trump administration and have literally zero better ideas for what to do about it.